Client injury from falling, due to: tripping, walking too fast, unsteady gait. Muscular, soft-tissue or skeletal injury to workers due to being pulled by falling client. Muscular, soft-tissue or skeletal injury to workers due to trying to stop client falling. b. Attempting to stop a falling client can increase the risk of injury to both the client and the worker. Resist any attempt to stop a client falling over by grabbing or catching them. c. Ensure client is wearing appropriate footwear for walking. d. Check that surface to be walked on is flat and even, remove tripping hazards and avoid inclines if possible. e. Check there is enough space for worker to walk beside client while assisting. Worker to get into position beside client. Worker is standing beside client. Position hands to support client while walking. Worker to place hand closest to client underneath the client's elbow for support. Worker to place hand furthest from client into the client's palm for support, with the thumb through the client's palm for the client to grip (not fingers or whole hand). 'Rolling Out' procedure (if required). Use 'rolling out' procedure for escaping a thumb grasp by client, if required. Little finger leads hand in a rolling out movement that levers out the worker's thumb without risk of injury from pulling. This action is necessary for the worker to avoid being pulled to the ground if client falls, or if squeezes hand too tight. Worker to take slow, steady steps with client. Do not link or grab arms for safety. Worker to provide minimum support required to maximise client's independence (refer to client's support plan). Once at destination, or for a rest, stop walking. 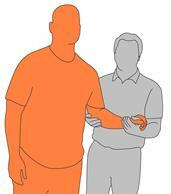 Worker to place one hand at back of client's hip to support them standing. Place other hand against client's shoulder for more support. If required, assist client to sit down (refer to Performing a Stand Transfer - a second worker may be required). Make sure client is safe. If client is unable to walk independently, ensure they are seated.